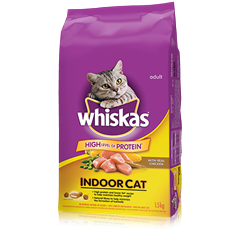 After the first serving, wet food is not always fresh for your cat – and cats find refrigerated leftovers 40% less appetizing+. 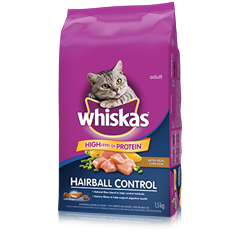 Plus, leftover wet food can be a messy hassle for you. That’s why we created a single serve meal for cats. +Sohail, M.A. (1983) Nutr Abs Rev B 53:177. PetLink 2007. 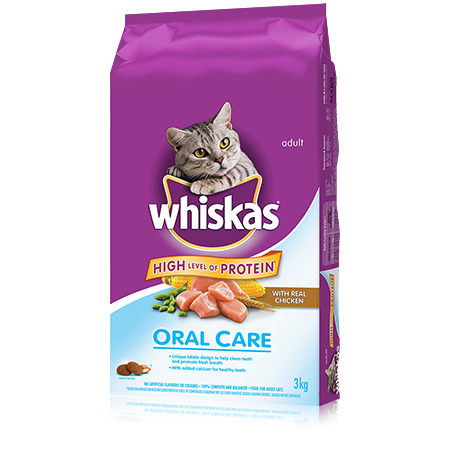 WHISKAS ® Oral Care is rated 4.3 out of 5 by 89. CHICKEN MEAL, CORN GLUTEN MEAL, CHICKEN BY-PRODUCT MEAL, GROUND YELLOW CORN, WHEAT, SOYBEAN MEAL, ANIMAL FAT (PRESERVED WITH BHA AND CITRIC ACID), NATURAL FLAVOUR, CHICKEN, BEET PULP, WHEAT FLOUR, RICE, POTASSIUM CHLORIDE, CARAMEL COLOUR, SALT, VITAMINS (CHOLINE CHLORIDE, VITAMIN E SUPPLEMENT, VITAMIN A SUPPLEMENT, NIACIN, VITAMIN B12 SUPPLEMENT, RIBOFLAVIN SUPPLEMENT, THIAMINE MONONITRATE [VITAMIN B1], D-CALCIUM PANTOTHENATE, VITAMIN D3 SUPPLEMENT, BIOTIN, FOLIC ACID, PYRIDOXINE HYDROCHLORIDE [VITAMIN B6]), TAURINE, dl METHIONINE, CALCIUM SULFATE, TRACE MINERALS (ZINC SULFATE, COPPER SULFATE, MANGANESE SULFATE, POTASSIUM IODIDE), CALCIUM CARBONATE, BHA, BHT. 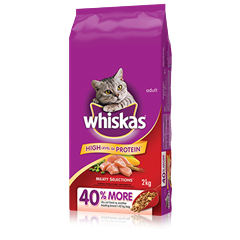 WHISKAS® Oral Care Dry Food Formula is formulated to meet the nutritional levels established by the AAFCO Cat Food Nutrient Profiles for adult maintenance.